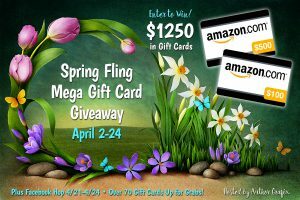 Romance Readers, Win $1250 in Gift Cards during the Spring Fling Giveaway! Click this image and enter to win up to $1250 in gift cards! Giving stuff away is fun, and who doesn’t need more gift cards, right? The fit is always perfect and the color always looks good with your complexion. That’s why I’m excited to join 77 other authors in giving you the chance to win one of nine Amazon Gift Cards—with a top prize worth $500! Click here to enter. Romance authors from every sub-genre (and a few non-romance authors) are participating including: paranormal, mystery, YA, new adult, suspense, thrillers, and urban fiction authors too. They write everything from sweet to super-steamy, so you can find your next favorite author by entering the contest too. Author newsletters tend to be filled with freebies, giveaways, and other goodies. Though you are free to unsubscribe at any time after the drawing, please don’t mark them as spam. Visit the Spring Fling Website to enter! Visit the Spring Fling Website now to enter! Get Ready to Win More Prizes During the Facebook Hop April 21-24! If you register for this raffle, you’ll also get info about the upcoming Facebook Hop with gift card giveaways at every stop ranging in value from $5 to $50.